In order to lose weight, you need to create a calorie deficit, or eat fewer total calories than your body burns. No single food can determine whether you lose weight, but some foods, such as yogurt, can make it easier for you to reduce your total calorie intake. Eat yogurt as part of an overall balanced diet, and consult with a nutritionist as you develop your weight loss plan. Yogurt can be good for weight loss because it is low in calories, with only about 120 calories in a cup of fat-free yogurt. Each 1-cup serving of yogurt provides about 8 g to 13 g protein, which is a filling nutrient because it slows down digestion so you feel less hungry for the next meal. Choose low-fat or fat-free yogurt instead of yogurt made from whole milk, because fat increases the calorie content. Save calories and support weight loss by using yogurt instead of high-fat, creamy salad dressings or vegetable dips. Have no-sugar-added flavored yogurt as a sweet alternative to high-calorie desserts such as ice cream, candy or baked goods. For a snack, a container of yogurt makes a convenient, portion-controlled option that promotes weight loss better than a multi-serving bag of potato chips or crackers. 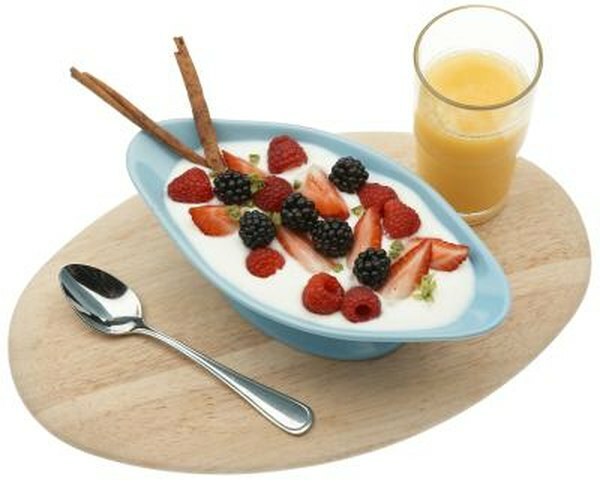 Add some fruit or whole-grain cereal to your yogurt for a calorie-controlled breakfast. Yogurt is naturally high in calcium, and individuals who eat about 1,200 mg to 1,400 mg calcium per day tend to have lower weights or better success in weight loss diets, according to the Linus Pauling Institute Micronutrient Information Center. A cup of yogurt has about 300 mg calcium. This potential effect of calcium may occur when you get calcium from food sources, not from dietary supplements, and too much calcium from supplements may lead to toxic effects such as kidney stones. To avoid slowing down your weight loss because of empty calories from added sugars, choose plain yogurt and add spices if you are eating it as a dip, or fruit, if you prefer it to be sweeter. Another low-calorie option is yogurt with a non-nutritive sweetener. Yogurt is best for weight loss when you eat it on its own, or with low-calorie, nutritious foods, such as fruit or oatmeal, and not when you add high-calorie foods, such as candy pieces or granola. Will Cheese Make You Fat?